I realize this is late now, but I’ve finally both recovered from devLink 2013 and (most importantly) caught up to the point that I can think about blog posts again. What a great time that was. I can’t overstate how much I enjoyed devLink. This was my first devLink (and obviously my first time presenting at devLink). I was clearly unprepared for the intensity of a three-day conference. By the end of the third day, I was worn out. I don’t think I could have fit another nugget of knowledge in my head. I was lucky to attend some great sessions by some great speakers that were willing to share the vast knowledge they have. For those that attended either of my sessions, thank you. I’ve posted the slides and notes for post sessions for anyone that is interested. Even though my day job does not do much with Azure (right now), I thought I should spend some time becoming familiar with the PowerShell connections available to Azure. I’m hardly stretching the state of the art here, but I have had more than a couple of instances lately where standing up a quick website using Azure Websites was handy. So far, I have done this using WebMatrix. While WebMatrix is a nice tool for the quick stuff, I feel like it has isolated me from the real deployment work flow. So off to PowerShell I go! Unfortunately, even early on I have found some things that rub me the wrong way. Take this example, when running the Set-AzureSubscription cmdlet. That is a perfect example of a bad help message. Another CodeStock is in the books. Just like every year, I had a great time, and I learned a lot. There were many great sessions this year and I’ll be digesting this information for a while. One of the things that struck me this year is that, even though there were great sessions, some of the most fun I had was outside of sessions. The dinners, social events and just hanging out with other developers was rejuvenating. It was great sharing ideas with everyone. At any conference, the sessions are what get most of the attention, but I realized this year that just talking to other developers is at least as valuable. My only “disappointment” this year was that there were too many good sessions. I didn’t get to attend but about half of what I wanted to. Part of that was scheduling overlap, and part was over-crowded rooms. Whatever the reason, the big take-away is that there were a high number of great sessions this year. More than once, I was unable to get into my first session pick during a time slot. I could point out that sticking more popular sessions in the smaller rooms wasn’t a great idea, I assume that point has already been made. Some of the sessions I ended up attending as backups were incredible. Next year, I’m going to continue to try to get into mostly sessions on technologies I currently use or am interested in, but I’m also going to make it a point to go to at least a couple of sessions that seem completely unrelated to my interests. “Phat Stacks” is one that sticks out in my mind. I ended up there completely by accident, and it ended up being one of the most interesting and informative sessions of the conference. I already mentioned the over-crowding in some sessions. Combined with the horizontal stacking of sessions, I’m hopeful that next year sees a return to the post-selection session builder. If we all could have preselected the sessions (out of the ones that were accepted to the conference) that we planned on attending, I think we could knock out both stacking and the crowding issues. Is there a technological solution for this? Again, even slight issues with scheduling aside, CodeStock 2013 was a wonderful and educational time. I can’t wait for next year. If you’re a fan of the show “Family Guy”, you may remember the joke where Robert Loggia was asked to spell his name. He did so by working his name into a sentence for every letter. For example, “E as in everybody loves Robert Loggia.” We’ve started doing that around the office, with the challenge being can you come up with the verbose spelling fast enough for it to still be relevant. I quickly decided that PowerShell could help me with this. There’s no trick here, really. I break up the incoming text to a character array, and for each letter I reference into a hash table of sentence beginnings to go with each letter. The real humor here comes when you pair this with the PowerShell Community Extensions’ cmdlet Out-Speech. You can you type something in and have the verbose spelling read to you. The default voice in Windows 7 doesn’t do a particularly good job of it, but it’s still fun. I’m already seeing ways to improve this, such as having each letter defined with multiple sentence starters where the script will pick one randomly. If you do anything neat to build on this, I’d love to hear about it! Conference season is almost upon us. Codestock is coming up in mid-July and DevLink at the end of August. I’m really looking forward to some focused learning as well as getting to “geek out” with some other developers. If you haven’t yet signed up for Codestock, you should do so if travel to Knoxville, TN is possible for you. It’s a great conference with some great people, all for less than the price of a couple of books. If you sign up before May 15, 2013, the tickets are at a reduced price and you get to cast a vote on which sessions will be selected. If you’re doing that, I’d appreciate a vote for the sessions I’ve submitted. Since nobody said otherwise and the information is on the website, I’m going to assume it’s public knowledge that I’ve also been selected to speak at DevLink. This will be the first year where I am able to attend DevLink, but I’ve always heard very good things about this conference. I encourage you to attend that one as well, if you can make it to Chattanooga, TN. It’s a little more expensive than Codestock, but it’s still a steal for three days. My employer has a lot of PowerShell v2 scripts in production, spread across a great many servers at a great many sites. It’s because I have to support these scripts in production that I have held off on updating myself to PowerShell v3. I finally got tired of holding myself back and took the plunge. I updated my PowerShell install, but was immediately hit with a wall of red text concerning an incompatibility in my install of PowerShell Community Extensions. No problem, I go and download the latest. Now I can run PowerShell, but I’m smacked in the face with problems from our deployment package scripts. What I really needed to be able to do right away was get back to a v2 compatible mode. Fortunately, that wasn’t too bad. 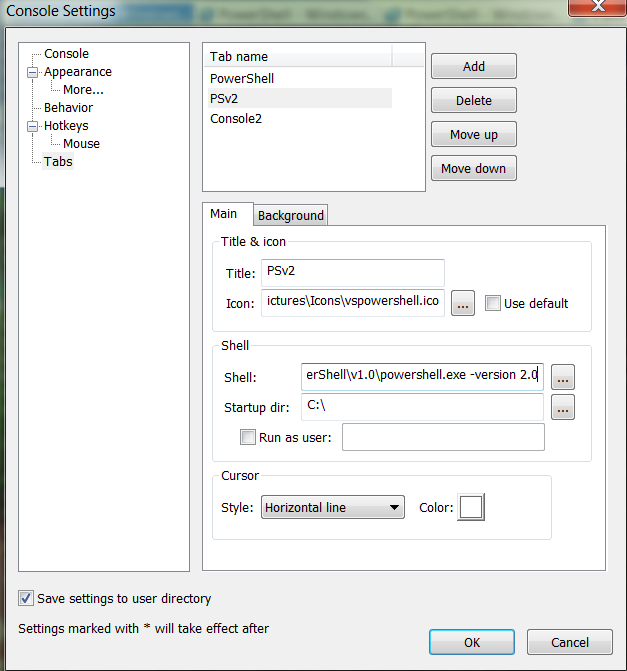 That will start version 2.0 of PowerShell. As far as I can tell, this isn’t just some compatibility mode, but the real v2 environment (if you know otherwise, let me know in the comments). You can tell there’s a difference by checking the value of $PSVersonTable, or by the difference in behavior in Start-Process. Now I can start up in version 2 and run all of our production scripts in the same environment that (most of) our servers will have. I’ve had to do this enough now that I just created a new tab type in Console2. Now when I want to be 100% sure that I’m stuck in PowerShell v2 mode for dealing with production scripts requiring that environment, I can just start up this tab. It’s clearly labeled via the title, and I selected a fairly irritating cursor style so that there’s never any question what mode I’m running. All of this is great, except now I get a wall of red text because the new PSCX I just installed doesn’t work with PowerShell v2. Don’t worry, there’s actually a fairly simple solution to that. 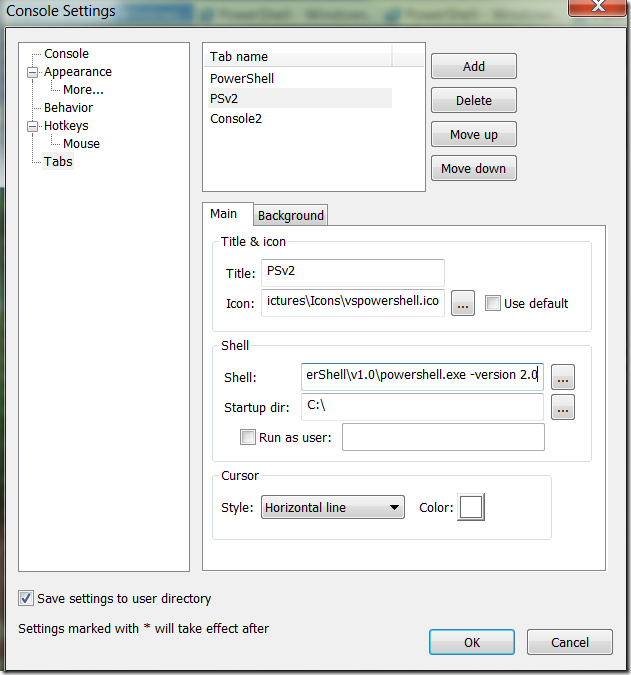 First, you’re going to want to go grab a version of PSCX that works with PowerShell v2. Install it to a sibling folder of your v3 PSCX install (I picked Modules\Pscx_21). Most of the time, Import-Module wants the module name and the name of the folder in which it is stored to be the same. The way around this is to point Import-Module to the actual .psd1 file. So Import-Module .\Modules\Pscx_21\Pscx.psd1 works just fine. Now a little bit of trickery with your $profile to figure out what version of PowerShell is being loaded, and to load the correct version of PSCX in response. Now you will be loading the correct version of PowerShell Community Extensions no matter which version of PowerShell you’re starting. Of course, there are still a few gotchas that we’ve bumped into in our upgrade. I’ll cover those in future posts. What about those of you reading this? Anything you want to warn other developers about before they upgrade to PowerShell version 3? In a recent upgrade to our product, we discovered that a great many of our custom reports had UniqueName properties that were incompatible with the new version of Telerik’s RadGrid. The question fell to me, “how many reports have spaces in their UniqueName property?” Fortunately, PowerShell made it fairly simple to identify the reports with problems. Wonderful, I have identified the problem. It should come as no surprise to any developer that the next step was “great, can you fix it?” I went through a few files by hand to verify that any kind of mass replace was unlikely to cause issues. Once I was sure it was “safe” (as safe as blindly replacing property values can be), PowerShell made a day-long job take only minutes. And that’s all there is to it. Any custom report that has a RadColumn defined with a UniqueName property containing a space would magically have that space removed, both in the ASPX page and the codebehind file. What about you? How would you have handled this differently? One of the great things about PowerShell is that there’s no One Way to handle everything, so post your solutions below. This post falls under the heading of things that probably don’t make much sense, except it was fun and I wanted to do something very specific using a very specific technology. Rather than run yet another program in my task tray (which mostly irritates me because of icon clutter and not system resources), how could I just use another tab in my PowerShell window to help me use The Pomodoro Technique? I came up with the following function that I’ve placed in my $profile. $player = New-Object System.Media.SoundPlayer "C:\Users\me\Dropbox\Music\CTU.wav"
What does this do? For starters, in my now-dedicated tab, I can just run “Start-Pomodoro” and get a 25-minute timer going, with a progress bar that shows how long I have remaining in my current pomodoro. At the end, it repeats the CTU ringtone from “24″ (which is just irritating enough to get my attention). I had to tinker with the delay on the sleep command so that the clip had time to complete before restarting, so you will need to do the same with whatever audio clip you use. If using an external audio clip isn’t your speed, you can just use whatever you have for system sounds. Just replace the two audio-playing lines above with something like the following. Like I said, I don’t know how useful this is. But it was fun, and I use it pretty much all day. Let’s break that down. I’m checking for the existence of a “My Weblog Posts” folder in my local documents folder. If one is not found, it creates a junction to the Dropbox folder. Good question. This depends on my having PowerShell setup and running on any new computer I use prior to installing or using Windows Live Writer. The way I work, I can 100% guarantee that both PowerShell and Dropbox are setup before I even think about things like Writer. Your workflow may be different, but you can pretty easily adapt this snippet to handle that. If I ever run into a situation where I Writer configured before PowerShell, I can just remove the folder manually and then let PowerShell take over. That feels safer to me than any script that would just blindly remove that folder, in case I had any local drafts saved that I might not want to delete.